Are you interested in setting up a trolley layout? There are lots of model railroaders out there that would love to build their own traction empire. I found quite a few clubs that are dedicated to it as well. 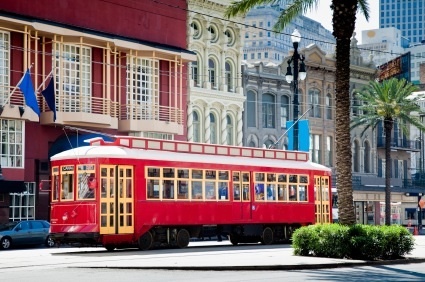 A trolley or traction layout might include streetcars winding around corners in busy city streets, country trolleys traveling through beautiful scenery, and rapid transit or light rail in more modern times. Many trolley layouts are built with prototypical-like operating overhead power wires, which are sometimes difficult to build but very much worth the effort. The trolley is operated by electricity traveling from the overhead wire through the trolley pole (pantograph) to the traction engine in the car which then turns the axles. Some trolley modelers prefer to just use rail power rather than to be purely and completely prototypical (especially in N-scale because of the difficulty in setting this up in that size). In that instance, the focus would be more on the scenery and practical operation of the layout rather than spending a lot of time on the wiring. In either case, there is fun to be had. Design and track-laying are a little different with trolleys than with steam or diesel layouts because of the tight curves that are possible with trolleys and because many trolleys operate in the middle of paved streets, which is a perhaps little more challenging than just throwing roadbed and track down and covering with ballast. You might consider using Tomix covers that turn regular roadbed track into street-track and/or Kato track that has elevated viaduct sectional track for N or HO scales. There is a lot of opportunity for automated operation on trolley layouts. You could have multiple trolleys operating on the same track route but have the individual trolleys stop at different times at specified locations to pick up or drop off passengers. Scenery building would be pretty much the same except the distances between towns would likely be shorter. The types of structures would be mostly those needed for passenger service - stations, shops, hotels, etc. - and probably less industry, lumber mills, coal mines, etc. that were reasonably priced. Eventually, many modelers like to scratch-build their own or purchase custom-built trolleys, which can be expensive. However, one that is well-built can last for many years. If you would like more information on creating a trolley layout, a great place to start would be at the East Penn Traction Club website which has a wealth of information on the site as well as links to other great resources to broaden your knowledge and further pique your interest in trolley and traction modeling. From "Trolley Layout" to "HomePage"